Terminalia is a tree. Three species of terminalia are used for medicine. These species are Terminalia arjuna, Terminalia bellerica, and Terminalia chebula. In traditional Ayurvedic medicine, Terminalia arjuna has been used to balance the three “humors”: kapha, pitta, and vata. It has also been used for asthma, bile duct disorders, scorpion stings, and poisonings. Terminalia contains ingredients that help stimulate the heart. It might also help the heart by lowering cholesterol and blood pressure. The bark of Terminalia arjuna has been used in India for more than 3000 years, primarily as a heart remedy. An Indian physician named Vagbhata has been credited as the first to use this product for heart conditions in the seventh century A.D. Research on terminalia has been going on since the 1930s, but studies have provided mixed results. Its role, if any, in heart disease still remains uncertain. 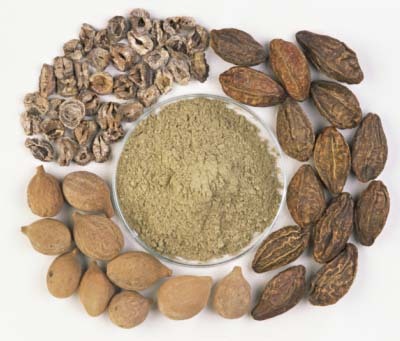 Nevertheless, people today use Terminalia arjuna for disorders of the heart and blood vessels (cardiovascular disease), including heart disease and related chest pain, high blood pressure, and high cholesterol. It is also used as “a water pill,” and for earaches, dysentery, sexually transmitted diseases (STDs), diseases of the urinary tract, and to increase sexual desire. Terminalia bellerica and Terminalia chebula are both used for high cholesterol and digestive disorders, including both diarrhea and constipation, and indigestion. They have also been used for HIV infection. Terminalia bellerica is used to protect the liver and to treat respiratory conditions, including respiratory tract infections, cough, and sore throat. Terminalia chebula is used for dysentery. Terminalia bellerica and Terminalia chebula are used as a lotion for sore eyes. Terminalia chebula is also used topically as a mouthwash and gargle. Intravaginally, Terminalia chebula is used as a douche for treating vaginal infections. In traditional Ayurvedic medicine, Terminalia bellerica has been used as a “health-harmonizer” in combination with Terminalia chebula and Emblica officinalis. This combination is also used to lower cholesterol and to prevent death of heart tissue. Treating chest pain (angina) after a heart attack, when used with conventional medications. Treating congestive heart failure (CHF), when used with conventional medications. Large-scale, long-term trials are needed to clarify any role terminalia might have in the treatment of cardiovascular diseases.